SIERRA VISTA — Mary Evangeline Lail-Letts, loving mother, grandmother, and wife, of Sierra Vista, AZ died on Monday, March 25th, 2019 after a long decline into the depths of Alzheimer’s. Mary was born 26 May 1945 in Hickory, North Carolina to Thomas M. and Minnie K. Caldwell Sr. She grew up in Hickory along with her brothers, Thomas & Robert Caldwell, and a sister, Jean (Tammy) Holler. A graduate of Hickory High, Mary went on to a successful life working as a dental technician and managing a Taco Bell store before focusing on raising her children and grandchildren. Mary and her husband Cliff arrived in Sierra Vista in 2003 where they resided while Cliff worked at Fort Huachuca and eventually joined Mary in retirement. 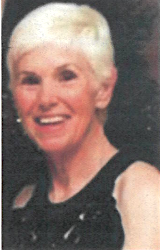 Mary was a devoted wife and stalwart supporter of activities and programs for kids. A staunch supporter of the military, she never met a service member without greeting them and thanking them for their service. Mary was an active supporter of the Army Aviation Association of America and was a recipient of their Lady of Loreto award. Her two favorite sayings were “can I help” and “where’s Cliff?” With her outgoing personality she made friends wherever she went and had a smile that would light up a room. Mary is survived by her husband Retired Colonel Clifford E Letts Jr, Sierra Vista, AZ; daughter Yvonne (Kenneth) McCollum, Warren MI; son Michael Lail, Columbus MI; daughter Natascha Smith, Roseville, MI, and many grandchildren and great grandchildren. A memorial service is being planned for a future date. Donations in memory of Mary should be made to the Alzheimer’s foundation.